Players in a competitive Unlimited draft at Grand Prix Chiba were expecting to open some of the most powerful, and valuable, cards in Magic: The Gathering, but what they got was a Black Lotus. A Black Lotus is one of the most valuable cards in Magic. Although it is played in very few formats of the game, it has a cultural cachet that’s undeniable for even people outside the Magic community. It is, in a word, special, and the draft event at the Grand Prix was all about really focusing on how special those early Magic sets are for many people. It’s no surprise that both the players and the big room of people watching on screens get very, very hype to see one opened. It’s Magic’s 25th birthday this year, and Wizards of the Coast have created a limited series of old-school drafts of cards at major events to celebrate. 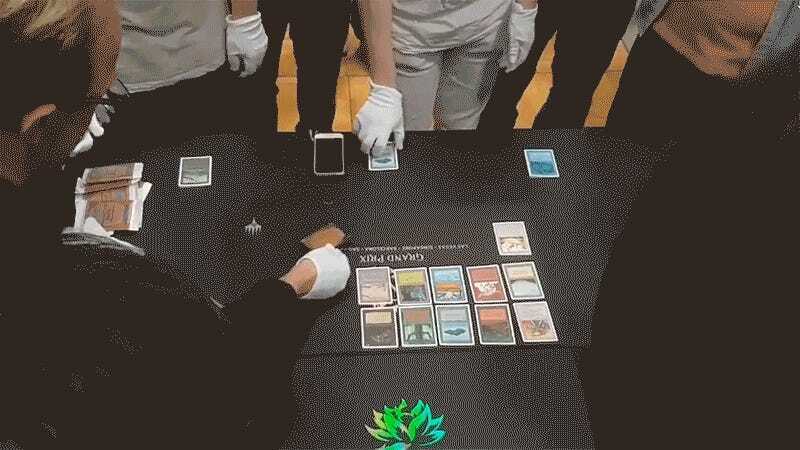 Held in a Rochester Draft format in which players all see a pack of cards and then make choices from it, there is a real possibility for showmanship when it comes to the judge who is putting the cards down on the table for all to see. It’s a dramatic moment, and it’s even better knowing that an Ancestral Recall was also opened. Update 4:35pm: To clarify, these are original Unlimited packs from 1993 that these players are drafting with. The excitement of these events derives from the fact that these are original Magic cards from the first couple years of the game that competitors are opening and playing with. Last month’s draft at Grand Prix Las Vegas was similarly gripping (I encourage every Magic fan to watch the entire event, or at least the draft and the final match), although there were not Black Lotuses to be found other than the one that Rich Hagon brought with him. It’s weird that opening a pack of cards is such a thrilling event, but seeing players get excited because they know that they’re going to play with (or play against) these cards in a competitive format legitimately gets me emotional about the game. Magic is good, y’all.